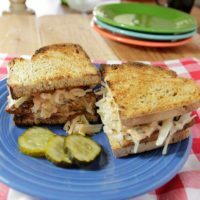 Here's a classic that still satisfies today and can be added to your list of easy to make meals, a vegan version of Sloppy Joe's. Keep it simple, right? Serve with a salad and you're ready to go. If you don't have any buns you can toast regular bread. A pita pocket or English muffin would even do. And if you're trying to cut down on bread, serve it open-faced and eat it with a fork. 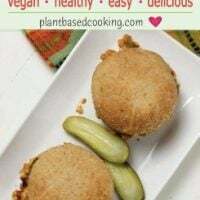 If you're not familiar with tempeh (pronounced tem-pay), it is a soybean "cake" that has been fermented which means it has probiotics much like live yogurt cultures do and it also has more protein (31 gram in one cup) and fiber than tofu. Tempeh is available in different combinations from "regular" soy tempeh, being only soybeans, to tempeh with grains or flaxseeds added and also flavored tempeh such as smokey maple tempeh bacon which is great on a BLT. Oh, and if you see some black on your tempeh from the store, this is a normal occurrence from the fermentation process. Anything other than black or white on your tempeh is inedible. Organic and non-GMO is available. 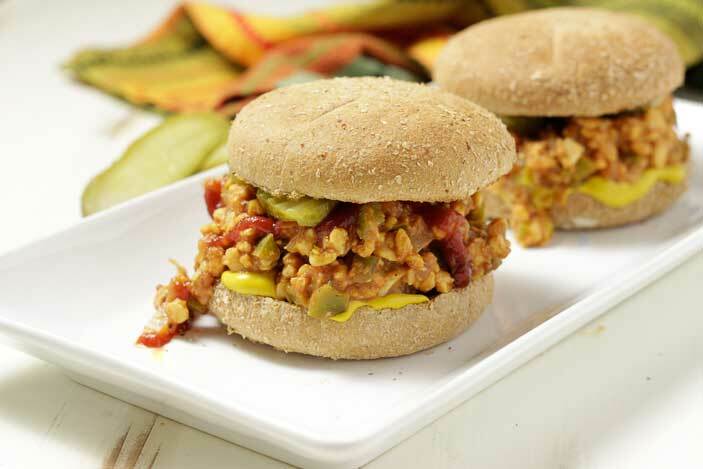 Tempeh is great to use as a ground meat substitute in many dishes such as spaghetti, chicken salad sandwich, tacos. 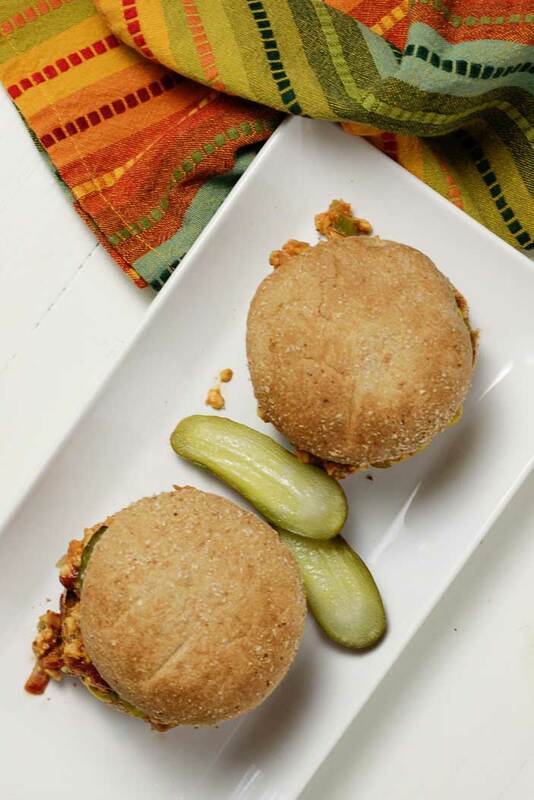 I'd love to hear your feedback in the comments below for this Sloppy Joes recipe! If you have a photo, post it on Instagram, tag me using the hashtag in your caption, and I won't miss it! 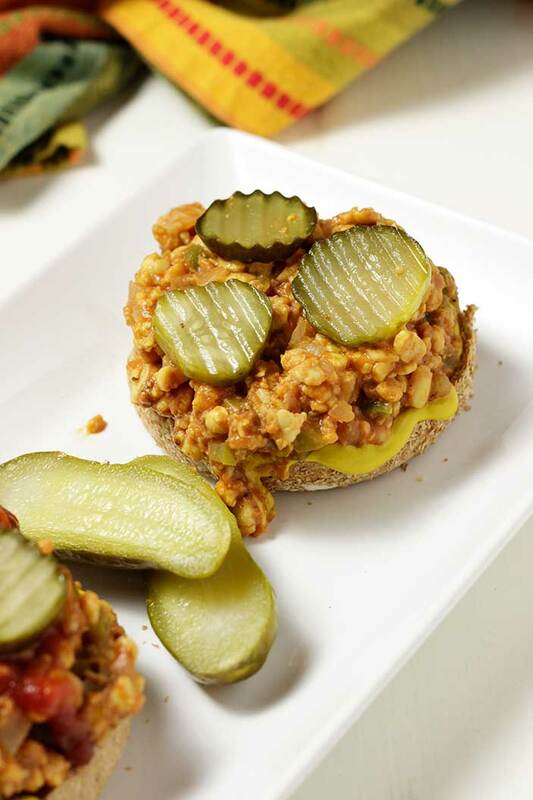 A classic made plant-based, Sloppy Joe's are a quick and easy weeknight dinner made with crumbled tempeh and seasoned with mustard and catsup. Saute the onion, garlic and green pepper in water or vegetable stock until they begin to wilt. Add the crumbled tempeh and the rest of the ingredients. If the mixture is too dry, add a little more tomato sauce or catsup and/or water. Simmer until all of the flavors have had a chance to mingle. *or a combination of catsup and tomato sauce marinara sauce can also be used in a pinch **Many Sloppy Joe recipes call for sugar. I personally don't find it necessary, but if you are use to it this way or want to add some, try a few drops of Stevia or 2 Tbl. brown sugar. 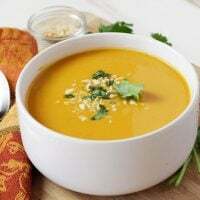 I get so confused when I read many of the recipes, also from forks over knives. The courses I took in a plant based diet pretty much taught us that any thing processed was not part of the diet. Over and over again I see different breads used or called for and they are not even 100% whole grain. Lots of times things like cacao is called for etc. isn’t plant based “off a bush, off a a tree or off the ground”? Just natural forms of plants? Thank you for the clarification. Hey Gail, thanks for your question. I understand. It can be confusing! I think the first thing to remember is that we live in the real world and sometimes the ideals for a diet like this can be hard to pull off in reality. 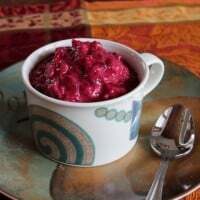 That isn’t to say that we shouldn’t try the best we can to follow the suggestions, but if you’re following the protocol in most areas and most of the time, you’re probably doing an excellent job for your health. I know, for example, that soy milk is processed but I wouldn’t eliminate it from a plant-based diet. Find the brands with the fewest ingredients, soybeans, and water, and you’re good to go. Be sure to read the labels with other packaged items. That way you can choose those with the fewest ingredients. This is a good practice and will certainly make your life easier and, I might add, make it more likely that you’ll continue to eat this way. You want to be successful, after all. You’ve probably heard the phrase, “perfect is the enemy of the good,” and I think that’s the case here. You’re obviously a very conscientious person and I know you can do it while not worrying too much about being exact. Now that you’ve taken the class, you’ll be better at substituting when you see ingredients that don’t fit. For example, substituting a whole grain bread for one that’s not. I hope that helps. Let me know if you need more clarification. And, feel free to ask me about specific food items if you have concerns.